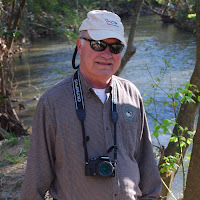 * Last month my guest photographer was my friend Jean Reed. Her friend Robert has offered me a few of his. Robert's from LA ( Lower Alabama !) in Baldwin County. Thanks Robert! Rickwood Field is 99 years and the Oldest Baseball Park in America! Each year in late May the Rickwood Classic is played. The Birmingham Barons and their opponents dress in period uniforms and play at this historic field. It's a great even for families and baseball enthusiasts. 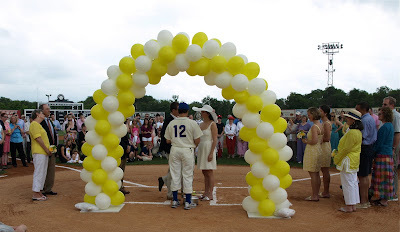 This year the field was the site of a Rickwood Family Wedding! ( Lower Alabama!) in Baldwin County. 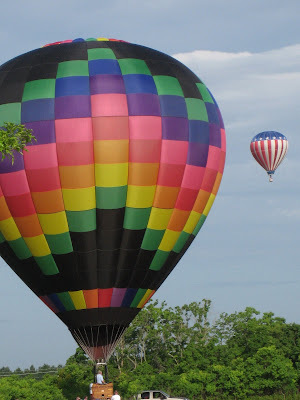 For the past 5 years the town of Foley, Alabama has hosted the Gulf Coast Hot Air Balloon Festival. 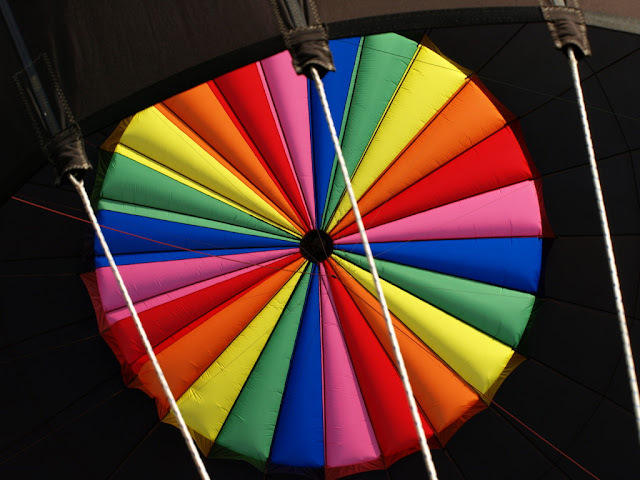 It's a three day event that features over 50 colorful hot air balloons. As in other small towns, one event calls for another and there are many simultaneous events for fun and fundraising going on . It takes place on Father's Day so come on down and enjoy the show! When Tom and I were prowling around upstairs at the Lyric Theatre several months ago, we found this room and I rather liked the view of the tiled roof across the street paired with the old glass paned door. 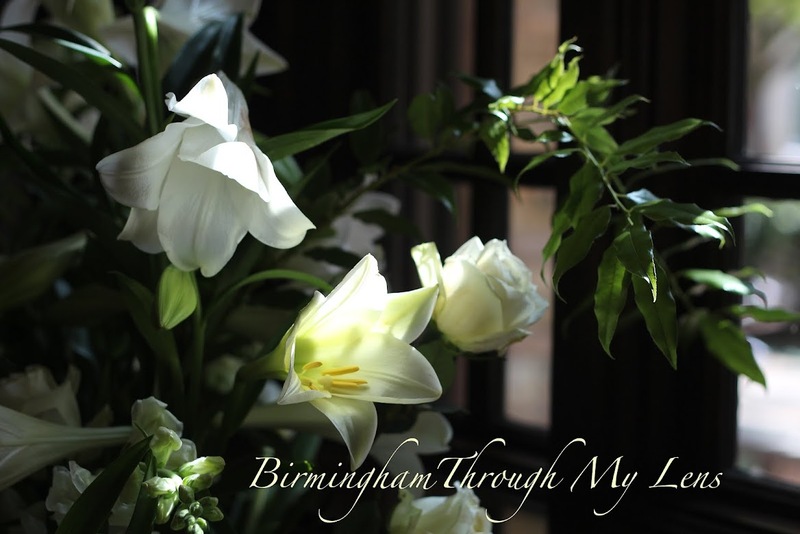 The second part in my series featuring all things red right here in Birmingham. Found this unusual chandelier at The Commissary a while back. This is a wonderful shop for gifts, artwork and antiques. My friend Snapper at Gabriola BC Daily Photo inspires me in a lot of ways. Lately his "Musicians' Hands Series" has knocked my flip flops off. I captured this guitarist and fiddler at the Magic City Art Connection. I apologize for not getting the name of the group. Snap suggested I try them in BW and of course he was spot on! 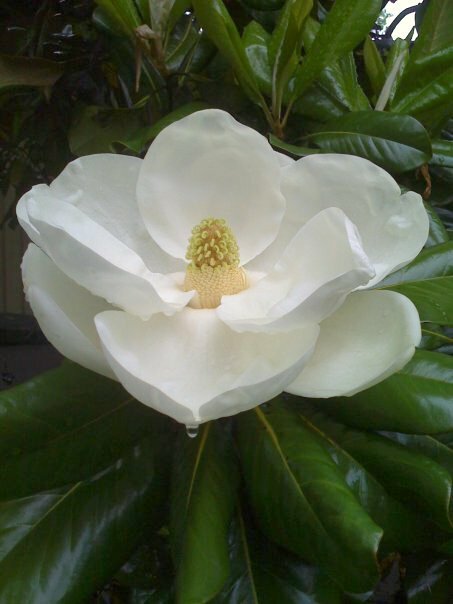 Merci to my friend John Hollingsworth for sharing this gorgeous magnolia blossom with all of us. John took this with his IPhone! ( I give up!) Some of you have asked about the magnolias found all over Birmingham. This is a lovely example. Well summer is definitely here in Birmingham. Some days it's just too hot to sit outside but this porch is a nice place to try and beat the heat. This is my friend Caroline's front porch. She lives in my neighborhood and hosted our neighborhood ladies' group (wine) a while back. Of course I couldn't pass up this photo op. It reminds me a lot of those grand old porches in the North Carolina mountains. Don't you just want to put your feet up and rock??? I've brought you to Rickwood Field many many times. Some of my favorite photographs were these with the strong shadows criss crossing the walls and ticket booths. If you live in Birmingham or come here to visit, you need to buy a ticket and experience a ballgame at America's Oldest Baseball Park! What is it about little boys and trains? I loved capturing my Davis watching this train going by after having lunch at the Irondale Cafe! The Redmont Hotel has been a Birmingham landmark for 81 years. It has been renovated and now offers hotel and resident accomodations. Located on 5th Avenue North in downtown Birmingham, I think the flags and umbrellas provide a grand welcome to guests. I have fond memories of band parties held there after college football games at Legion Field, during my Auburn days. The bright and colorful doors have closed. Red Rain was a fixture in downtown Homewood for years. They offered earth friendly, cruelty free products and some nice plants as well. They had a big closing sale with savings up to 70% off so I took a look. I decided I'd better capture this wonderful door, before it closed for good. A sad sign of the times. In April when my blog friends Janet and Maya paid me a visit, you might remember our trip to Cullman, AL to see the Ave Maria Grotto. This cemetery is where the Benedictine monks from St. Bernard Abbey are buried. What a lovely spot. It was a privelege to capture these photographs of their resting place. Recently I was fortunate to meet Birmingham artist Lonnie Holley. I was thrilled that he allowed me to capture his interesting hands while he was doing a demonstration at Lite Box Gallery at the Pepper Place. NOTE: Our friend Amir at Tehran Daily Photo is posting photos again! One Grilled Cheese Coming Up! I've been saving this portrait from the Sloss Furnaces Cast Iron Pour last spring. Some people will go to any lengths for a good grilled cheese! Barn door? Nope. I found this in one of the main sheds at Sloss Furnaces during the Cast Iron Pour in the spring. I'm including this great old sign that was a reminder for the workers when Sloss was in its heydey. I think the Madonna is a nice touch! When you enter Cahaba Clayworks in Leeds, you see this exquisite vase by artist Larry Allen. When I get back home, I promise to make another visit and capture Larry creating his amazing pottery. Well it looks like the Lawrence family is taking over as chief photographers in our family. 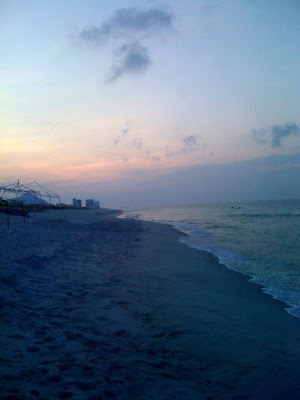 Today hot off the IPHONE in Navarre Beach, Florida, daughter Kathleen snapped this sunrise while doing her dawn run! I thought vacation meant you didn't have to exercise. Maybe THAT'S my problem!!! Here in Paris it's not uncommon to see people sitting outside of cafes and bistros smoking. Here in Birmingham, probably not so much. I spotted this weathered table outside of Chez Fonfon on the southside. Last year I took you to Bottega Restaurant and Cafe´. Located on Highland Avenue near Five Points South, this is one of Chef Frank Stitt's "fleet" of fine restaurants. I had the pleasure of having lunch at the cafe with my daughter and granddaughter, a little Grandparents' Day celebration last May. The food was delicious, and as we were leaving I decided to take a few photographs! I have another guest photographer today, my son -in-law Jason. He took this shot of my daughter Kathleen while they were sailing in Santa Rosa Sound at Navarre Beach, FL. This photo was even published in "Latitudes and Attitudes" sailing magazine. Congratulations to Jason for being the first in our family to be published!!!! I'm running on empty here in Paris. It's been a loooonnnnggg day. More tomorrow! How about Styx playing "Come Sail Away" today? Paris Update: My luggage has been found! Since I'm spending my first night in Paris tonight, I thought this an appropriate photograph. It's one more for the Shadows Series. This time I combine it with my Table/Chair Series. You knew there would have be a chair or table somewhere! I'm sure Laurie will ask if this is where I fling my peignoir, and yes ma'am, it is ! Yawn....... bonne nuit everyone! Those of you that follow my Paris Through My Lens blog know that I seem to be drawn to photographing all things RED! I didn't realize it till some of my more astute readers pointed it out. I started a series that I 've called "Paris Rouge". As I was pouring over my current Birmingham stash, I realized I had a few here as well. Today is the first in the series. Enjoy! As you read this I will A. Be whiling away many hours in the Atlanta airport. B. Finally be catching a jet plane to Paris. Stay tuned to find out when I finally touch my toes on Paris soil. Au revoir! This photograph takes me right back to summers spent as a little girl at my grandparents' ( you know them by now, Nanny and Big Daddy) home on Water Street in North Little Rock, Arkansas. On summer afternoons, Nanny would spread newspapers on the kitchen table, take out a butcher knife as long as my arm and carve us up big slices of cold watermelon. She always made me take my shirt off, and I can still remember that cold juice running down my tummy. Ahhh, sweet memories. This shot is dedicated to Nathalie at Avignon FR Daily Photo , Marley at Cheltenham Daily Photo , and our friend Abe Lincoln who blogs from Brookville, OH. They are superb macro photographers. They have inspired me to get, probably a little too close to this guy! He had his beady little eyes right on me! My last trip to the Pepper Place Market, I passed this nice lady taking a little break from selling shelled peas and butter beans. It was HOT that morning and she was fanning with what looked like a towel. I jokingly told here she needed a "funeral home fan". The young man in the group photo below said he knew what I meant and ran to the truck and produced one. It didn't come from a funeral home but it worked just fine. She put it up when she saw my camera, but I sweet talked her into letting me get her photo. Voilá! Thank you ma'am!! The Bottle Tree on Birmingham's southside is just a great fun and funky place to have a drink, some good food and hear live entertainment. Chef Tom Bagby is a dear family friend, and he's known for his killer pimento cheese, as well as some delectable sounding vegetarian dishes, which I regret to report I've not tried. It's also a photographer's paradise, and there will be more photos in days to come. Don't you just love this table and chairs??? It's the Fourth of July. All over Birmingham folks are cooking ribs, munching on potato salad and baked beans and cranking homemade ice cream. There's also a whole lot of flag waving going on. My adorable next door neighbors, Jay and William patiently cooperated while Miss Virginia took a zillion photos in my driveway last week. I thought you might also enjoy Kate Smith's legendary rendition of "God Bless America" as well. Nobody could sing it like she could! Happy Birthday America! Back in May, the STAIR tutors took their students to the Birmingham Zoo as an end of the year field trip. I found these flamingoes to be great subjects. They came very close to the fence and then did a little tail feather shaking for us! * I checked out Amir's Tehran Daily Photo blog today. He has posted a short message for us. You might want to read it. What a blessing to have him home safely and able to correspond with us again! I don't know about you, but I LOVE Dan and John as the Blues Brothers. Sing it brothers!!!! PORTRAITS FROM MY HEART - The Fab Five! It's been quite a while since I've posted a photo for my Portraits From My Heart series. Today a RARE shot of all five and look, everyone's happy! They lined themselves up by age. Left to right: Lindley 8, Eva 7, Chappell 6, Laura Kate and Davis both 4 1/2. The Fab Four has a tune for us today! * They'll make another appearance on the 4th of July! Today City Daily Photo Bloggers around the world turn their cameras toward a common theme... EMPTY. My contribution is this stack of wire baskets just waiting to be filled with fresh produce from Oak Street Market in Crestline Village. I love seeing how my City Daily Photo Blog friends around the world have interpreted the monthly theme. Click below and see for yourself. You won't be disappointed.